10 YEARS AFTER THE INVASION OF IRAQ"
Journalist and author Reese Erlich will address the wave of popular uprisings in SW Asia and North Africa in the context of the 10 year anniversary of the US war on Iraq on Saturday, February 16 at 7 PM. 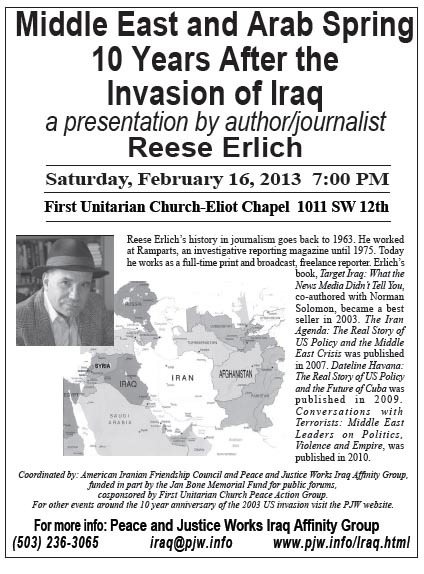 Erlich's talk, "Middle East and Arab Spring, 10 Years After the Invasion of Iraq" will be held in the Eliot Chapel at First Unitarian Church, 1011 SW 12th in downtown Portland. Reese Erlich's history in journalism goes back to 1963. He worked at Ramparts, an investigative reporting magazine until 1975. Today he works as a full-time print and broadcast, freelance reporter. Erlich's book, "Target Iraq: What the News Media Didn't Tell You," co-authored with Norman Solomon, became a best seller in 2003. "The Iran Agenda: The Real Story of US Policy and the Middle East Crisis" was published in 2007. "Dateline Havana: The Real Story of US Policy and the Future of Cuba" was published in 2009. "Conversations with Terrorists: Middle East Leaders on Politics, Violence and Empire, was published in 2010." Erlich shared a Peabody Award in 2006 as a segment producer for "Crossing East," a radio documentary on the history of Asians in the US. The event is free and open to the public. It is coordinated by American Iranian Friendship Council and Peace and Justice Works (PJW) Iraq Affinity Group, funded in part by the Jan Bone Memorial Fund for public forums, and is cosponsored by the First Unitarian Church Peace Action Group, American Friends Service Committee, Oregon Physicians for Social Responsibility, Women's International League for Peace and Freedom-Portland, Jewish Voice for Peace-Portland Chapter and Veterans for Peace Chapter 72. For other events around the 10 year anniversary of the 2003 US invasion visit the PJW website at http://www.pjw.info. For more information or for your organization to get involved contact PJW at 503-236-3065 or iraq @ pjw.info.